Are you preparing yourself for the Revelian Cognitive Ability Test (RCAT) but feel as though you are lacking the essential practice materials needed? Here at JobTestPrep, we provide simulated Revelian-style tests that include the format of the test itself, as well as answer explanations, and score reports. With our Revelian Cognitive Ability Test PrepPack™, you will be able to improve your familiarity and knowledge of the RCAT test’s content in no time! The Revelian Cognitive Ability Test (RCAT), also formerly known as Onetest, is a unique exam which aims at evaluating your cognitive abilities. The RCAT questions are designed to measure your mathematical, verbal, and abstract/logical reasoning skills. At JobTestPrep, we offer an exclusive Revelian Cognitive Aptitude Test PrepPack™, which consists of 4 full-length Revelian CAT-style practice tests, 1 diagnostic test, 9 word problem practice test, 7 study guides, and so much more! Revelian is a favored Australian psychometric assessment company that offers a wide variety of aptitude exams that are implemented during the recruitment process by companies all over the world. Revelian prides itself in offering organizations and companies a way to strengthen their work atmosphere by improving their team dynamic, overall efficiency, and their selection process when hiring motivated and capable candidates. The Revelian Cognitive Ability Test (RCAT) measures candidates’ cognitive ability and general knowledge. The test consists of 51 randomly selected questions and has a time limit of 20 minutes. The Revelian test is composed of three different types of questions: numerical, verbal, and abstract. Each question becomes increasingly more difficult as the test progresses and the test is structured differently for each candidate and type of job position. Furthermore, the test includes a wide range of questions with different difficulty levels. This ensures that employers receive honest and raw data from the Revelian cognitive ability test. It is important to note that this product refers to the Cognitive Ability Test and not to Revelian's game-based test and Cognify series. Verbal reasoning test questions are used throughout the RCAT in order to assess how well you can comprehend, assess, and solve the written information which is provided. To answer these test questions correctly, you will need to have basic language skills. Which two statements together PROVE that Anne’s favourite food is not chips? (1) Anne likes ice cream. (2) Beth’s favourite food is chips. (3) Beth does not like fish. (4) Anne and Beth have the same favourite drink. (5) Anne and Beth do not have the same favourite food. The correct answer is (2) and (5). Though (1) states that Anne likes ice cream, this does not mean that ice cream is Anne’s favourite food. (3) cannot be combined with any other statement to prove what you are trying to prove. (4) cannot be combined with any other statement to prove what you are trying to prove. If, according to (2), Beth’s favourite food is chips, and if, according to (5), Anne and Beth do not have the same favourite food, then Anne’s favourite food is not chips. Therefore, the correct answer is (2) and (5). Numerical test questions are given during the RCAT to evaluate your use and capabilities when working with numbers. These questions specifically address the four basic numerical functions, which are addition, subtraction, multiplication, and division. What is the missing number that should take the place of the question mark? Numerical Square is a subtype of Numerical Series. It has three rows and three columns. Each row follows one rule and each column another rule. These rules can either be identical or different. 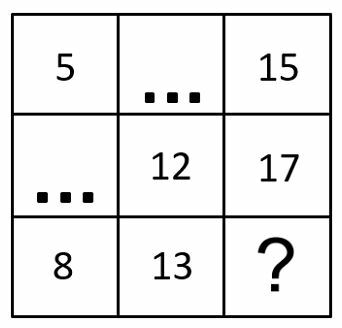 There are numbers hidden in the boxes containing three black dots. Sometimes, finding these numbers can help you replace the question mark. Since every row and every column each follow one simply find another row or column in which the numbers are already filled in the place that includes the ?. For example, in the middle column, the 12 and 13 line up with the 17 and ? from the right column. Since 13 is 1 greater than 12, ? must be 1 greater than 17. Thus, the correct answer must be 17 + 1 = 18. Therefore, the correct answer is 18. Abstract test questions measure the way you think laterally. These questions display logical patterns through a sequence of different shapes/images. The patterns are often ordered from left to right. Once the pattern is determined, you must either choose the next, missing, or unfitting shape/image. Which ONE of the five items does not belong with the others? Explanation: each frame has an elliptical shape, a triangle, a double-headed arrow and two small circles connected by a line (one white and one black). In each frame, the ellipse and the triangle are either black or white. In frames 1, 2, 4 and 5, a white ellipse or white triangle is facing a little black circle, whilst a black ellipse or a black triangle is facing a little white circle. In options 1, 2, 4, and 5, the large shapes and little dots which face each other are always of opposite colours (black/white). However, in frame 3, the large shapes and little dots which face one another exhibit the same colours. Therefore, the correct answer is 3. Prepare with our Revelian cognitive ability test practice! Practice for the Revelian Cognitive Ability test with our customized PrepPack™ so that you can acquire the skills and knowledge to be fully prepared to succeed on the real RCAT test! Revelian and other trademarks are the property of their respective trademark holders. None of the trademark holders are affiliated with JobTestPrep or this website.